Man does not live by bread alone, but by every word that proceeds out of the mouth of the Lord does man live (Deuteronomy 8:3), Jesus is the bread of life given us from heaven above. (John 6:29-38). Jesus answered and said unto them, This is the work of God, that ye believe on him whom he hath sent. They said therefore unto him, What sign shewest thou then, that we may see, and believe thee? what dost thou work? Our fathers did eat manna in the desert; as it is written, He gave them bread from heaven to eat. Then Jesus said unto them, Verily, verily, I say unto you, Moses gave you not that bread from heaven; but my Father giveth you the true bread from heaven. For the bread of God is he which cometh down from heaven, and giveth life unto the world.Then said they unto him, Lord, evermore give us this bread. And Jesus said unto them, I am the bread of life: he that cometh to me shall never hunger; and he that believeth on me shall never thirst. But I said unto you, That ye also have seen me, and believe not. All that the Father giveth me shall come to me; and him that cometh to me I will in no wise cast out. For I came down from heaven, not to do mine own will, but the will of him that sent me. People can go about and believe many different doctrines but the ONLY WAY to heaven is by the faith and belief one has in the only begotten Son of God the Lord Jesus Christ. 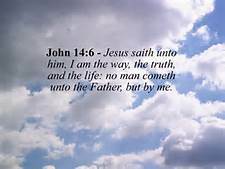 (John 14:6) Jesus saith unto him, I am the way, the truth, and the life: no man cometh unto the Father, but by me. (Acts 4:10-12). We are begat by the word of God by His will, for the word is life giving and is able to save our soul. (James 1:18-21). Of his own will begat he us with the word of truth, that we should be a kind of firstfruits of his creatures. Wherefore, my beloved brethren, let every man be swift to hear, slow to speak, slow to wrath: For the wrath of man worketh not the righteousness of God. Wherefore lay apart all filthiness and superfluity of naughtiness, and receive with meekness the engrafted word, which is able to save your souls. Although it may be easy to murmur and complain as we go through this life, to focus on being a light in a world of darkness is more beneficial for us in doing the will of God and speak the word of life whenever possible. (Philippians 2:12-16).